Outside the Box: There's no I in TEAM...or is there?!?!?! As School Psychologists we are going to be a part of the Child StudyTeam in whatever kind of school that we choose. As in any "team,"there are always going to be conflicting personalities and people thatare difficult to get along with. No matter what type of people we haveon our team, we're going to have to learn to work together. How do youfeel about team dynamics and how will they affect our jobs? Ifeveryone got along and had similar systems of working, that would bean ideal situation. But, that will not always happen. There are many factors that contribute to the team dynamic--age, howlong they've been there, methods, opinions, and much more. 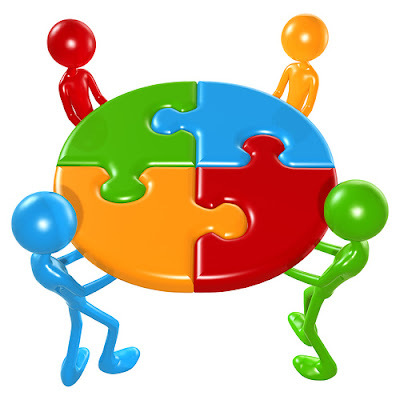 Do youthink there are different strategies we can use to solidify themembers in order to work better together? What role, if any, does theSupervisor have in this? I think morale and mutual respect are important components for any team. As School Psychologists we will most likely being leading the child study team meetings and therefore, be responsible for how those meetings play out. Ensuring an environment in which all members feel valued allows for productivity even in the face of differing opinions and idealogies. I think that ideological diversity is a good thing. It keeps everyone on there toes, and brings new ways of thinking to the table. Of course, it also creates conflict! I think some conflict is a good thing. It inspires change. I think it is important that we NOT view ourselves as "leaders of the meeting". We are all equal, and knowledgeable about our relevant subject areas. This goes for the parent, the teacher, the LDTC, the social worker, and the nurse. Everyone has an equal amount to contribute. I think this perspective will foster open, respectful communication. Another thing I think is important is being flexible. There are some things that need to be compromised on, others that you cannot. Pick your battles. And definitely try to "battle" in private. No one wants to be called out in front of the colleagues. I think the role that the supervisor has in all of this can be viewed within a systems perspective. Attitude is contagious. Attitudes of "top down" leadership, lack of respect for followers, etc. contribute to an unpleasant working environment. I think our job will not be any different than any other workplace. There will always be individuals that we’ll get along with and those that will be difficult to work with. We as future school psychologists and members of the CST, will have to try hard to get along with our team members and make sure that we all make the best decisions when it comes to children we will be servicing. Last semester while I was shadowing, I’ve seen a team that was getting along together. However, in other schools (same district), there are members of the CST who barely speak to one another and one can feel tension between team members. Perhaps we could try to explain to our team that we are all here to help children first (that is our main goal). Also, as someone already mentioned above, it is crucial that we do not put other team members down and think that we’re the most important person on our team (since that could create a lot of tension among the entire team). If everyone got along, we would all have the same ideas. I agree it can be very frustrating to work with someone when you don't see eye-to-eye, but conflict brings about change, usually. I think that the supervisor should be part of a collaborative effort to make the CST as functional as possible. In my placement, the supervisor has a caseload, albeit small. She is a participating member of the team. While she has the final say-so in many situations, she is still a team member and she participates in every meeting. In my last placement, the supervisor of Special Ed was rarely ever present for meetings, and this scenario is far too common. It's important to remember that each member of the team has a lot to contribute to the well-being of the student. While it's true that as school psychologists we will probably have the most hours of formal education, experience is worth its weight in gold. We need to be sure we regard other team members as a valuable resource and remember that we are not the team leader, per se, as Roxane stated. I agree with what you are all saying. There is always going to be differing opinions and that is definitely productive to bring up various ideas and conflicting ideas so we can compare and contrast them. However, some people let personal issues with coworkers interfere with their jobs and with their duties, and I feel that's where the issues arise. I've seen this happen in schools where two people don't get along and they let that interfere with their roles with the children. This is obviously a problem that needs to be addressed. I think having a supervisor that is as involved as you described, Jess, is awesome. But we won't always have situations like that. Like mentioned, there are some districts where the supervisor is barely seen. So, like many other factors, I believe team dynamic will depend on the individual district and people and the team members should try to get along as much as possible because, as you all said, we are there for the children. Team dynamics have everything to do with how well educational professionals serve children and families. What is clear, is that as all of you have said, our priority is professional service. Adults who are contracted to educate, have a responsibility to find common ground, so that the work can be done.